A week has passed since we arrived at the house. So far, we've mostly been hanging with the pets and doing lots of cooking. Michael's been sick, so we've taken it easy, but now we're going explore the snow more, there's a mountain nearby for skiing and snow tubing. 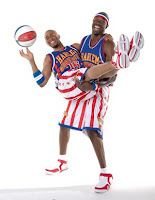 A couple of days ago, Michael and I we were hired to photograph a Harlem Globetrotters game in Worcester. It was pretty easy work, and I got to meet Tiny, who is the tallest player (7 ft). I had forgotten how corny the shows are. Lots of fart sounds. We've explored the town a bit, found a cool video store, a really delicious Indian restaurant and one not so delicious. The Mexican restaurants up here are not so impressive, all run by whities. I am in awe of the grocery stores nearby, such fresh and exotic produce at reasonable prices. I don't know why we don't have stores this good in Nashville. 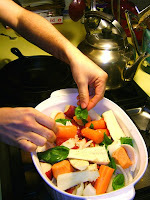 We've been trying lots of new dishes since we can now easily find all the ingredients that they call for. Except, we have been to three places looking for a pomegranate. Where the hell are they?! I made guacamole for the first time. Michael made a wonderful white chili. 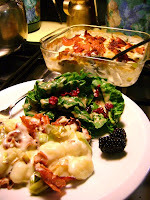 Tonight, I made a leek-and-gnocchi bake with three cheeses and crispy prosciutto (pictured below). Next, I'm going to attempt a caramel pie, since we never found one in New York. Enough about food. I will post pictures of the animals and the house soon. The owners have an interesting decorating taste.